Our journey to light the orbs is now half over (or two-thirds over if you look at game time). 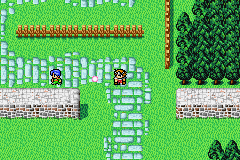 The next two orbs are not as easily obtained as the first, unfortunately. There are several prerequisites that must be fulfilled before we can proceed to the Water and Air Orbs. I should mention here, before we get too far, that you will be required to pay 40,000 Gil for one of the items we need. I will be telling you how to get it at the end of this section, but you should start saving up now. On the northwest continent, there is a city called Onrac. This city is the entrance to the Sunken Shrine. Northwest of this city is a waterfall. This is our current destination. Towns like these should really invest in an airship landing pad. Enhances party’s defense against death. Restores a lot of HP to entire party. Raises caster’s attack and accuracy. Blinds one foe with darkness. The inside of the Waterfall Cavern is much like a maze. Every couple of feet there is a fork in the path. As a general rule, always take the westernmost or southernmost path. 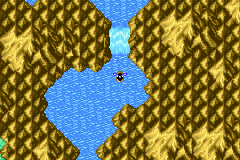 The map of the Waterfall Cavern will make things much more clear than any explanation I could give. Your destination is the long, rectangular room you see at the bottom of the map. When you get there, help yourself to all of the treasure chests. You will find over half of the 40,000 Gil you need right here, so don’t be shy. Before you leave, MAKE SURE YOU SPEAK TO THE ROBOT! He will give you an item called the ‘Warp Cube’, then break. (I can’t help but think this robot is an early model CL4P-TP). The Warp Cube is a key item necessary to get from the Mirage Tower to the Flying Fortress later in the game. If you’re still short on Gil, the Waterfall Cavern isn’t a bad place for a little grinding. The Clay Golems you encounter readily here drop 800 Gil each, and the Nightmares drop 700. With your new items (and possibly jingly pockets), exit the Waterfall Cavern and row back to your airship. There’s a cave behind the world’s only waterfall. How could I have ever guessed. Our next target is the hidden Caravan. It is located in the small desert on the same continent as Onrac and the Waterfall Cavern. If you fly over the northwest portion of the desert, you will notice that there is a little section that is separated from the rest. This is where the Caravan is located. Land you airship at a suitable location and enter. The Caravan is comprised of a single tent, home to a single merchant that sells a single product: a Bottled Faerie. The price is 40,000 Gil. It may seem like a lot (or it may be pocket change, depending on your play style) but it is a necessary expenditure if we want to proceed in the game. If you’re playing one of the modern remakes of Final Fantasy I, the Caravan merchant will suddenly remember he has more things to sell once the Faerie has been purchased. These new items all grant temporary boots to various stats for your characters. I’ve never found much use for any of these items, but it could just be that I’m not creative enough. 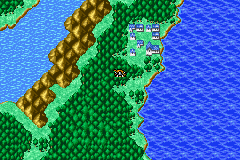 Compared to how obvious the Waterfall Cavern is, the Caravan is considerably harder to find. After buying the Bottled Faerie, hop back in your airship and head to the city of Gaia (which is west and a little north of the Caravan). As soon as you enter the city, the Faerie will be released from its bottle and fly off. Now it’s time to find where it went. You should head west, past all the shops, north, past the Inn, then east and into the woods. If you follow the path, you will soon come to a lake where the Faerie will be waiting. Approach the lake and talk to the Faerie. She will recognize that you were the ones that rescued her, apologize for “running” off, and offer to retrieve Oxyale from the bottom of the lake. 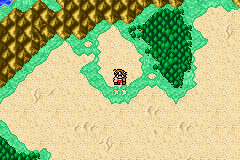 Since Oxyale allows you to breathe underwater, it will be indispensable when we reach the Sunken Shrine. After obtaining the Oxyale, return to your airship and return once again to Onrac. The Sunken Shrine awaits! I released a fairy from a bottle, but it didn’t restore my health. I’ve been spoiled by the Legend of Zelda.